In the copper smelting process, sulfides are oxidized by the injected oxygen in the liquid bath. The reaction rate is predominantly determined by the stirring conditions of the bath. Single lance mixing experiments were carried out in a horizontal cylindrical vessel with different gas blown angles to simulate the smelting furnaces gas blown from side and bottom. The mixing behaviors were studied by quantifying the mixing time of the bath under different conditions. The results show that the increase of gas flow rate decreases the mixing time rapidly before it reaches a plateau. In the side blown furnace, mixing time was also shortened significantly by increasing bath height up to certain values, followed by minor promotions of mixing time if further increasing the bath heights. In comparison to the side blown process with the same gas flow conditions, the bottom blown process took more time for the bath to reach homogeneity under the same operating conditions. Manuscript submitted May 16, 2018. 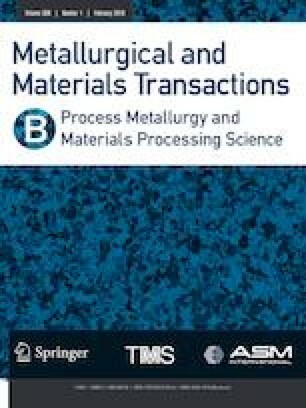 The authors would like to thank National Copper Corporation of Chile (Codelco), Dongying Fangyuan Nonferrous Metals (Fangyuan), and Australia Research Council for the financial support through the ARC Linkage program.